I am currently involved in a project bringing a complete suite of payroll and human resource applications in one ASP framework. A Payroll/HR player in Holland wants to centralize all their apps and provide software as a service (also known as SaaS). Their ASP model consists of an authentication/authorization layer, where probably BMC® Identity Management for .Net is going to be used. More about the product can be found here. Second layer will be a visual integration layer (presentation), so customers get an integrated feeling when they use their applications instead of opening all applications separately. 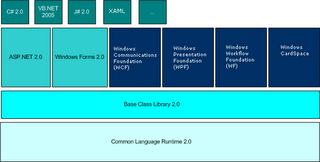 This layer will be build completly with ASP.NET 2.0. Third Layer will be all the applications hooked with the second layer and this is the interesting part. .Net Technology is used throughout this organization and they want to develop interfaces between third and second layer using Windows Communication Foundation. So an interesting challenge using .NET in all layers together with third party software (BMC) and custom build software (.NET, other development languages like java and so on). More about netfx3.0 can be found here here .